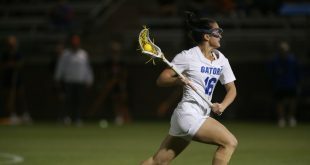 The University of Florida lacrosse team (8-2) takes on Dartmouth (3-2) tonight at 6:30 at home. 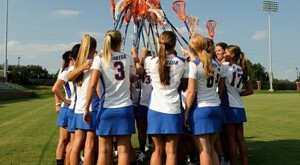 Despite coming off a loss to Syracuse over the weekend, the Gators remain ranked number 4 in the IWLCA poll. Gator coach Amanda O’Leary says that 19 turnovers against Syracuse is uncharacteristic of her team. “We had nineteen turnovers, which obviously against a team like Syracuse, you can’t have. It’s a little uncharacteristic of us. We haven’t had that many turnovers since our Carolina game, so it kind of put us on our heels,” she said. The Gators have lost just two games this season and they happen to be against the top two teams in the country. Since last season, Florida has lost 11 of their seniors, so freshmen have had to contribute a lot this year. Coach O’Leary shares her thoughts about the transition from last season to this season. 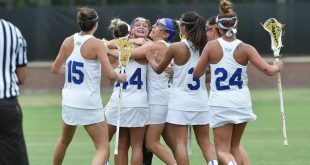 Florida owns a 2-0 record against Dartmouth, and is ready to bounce back from its loss to Syracuse. Florida has made it tough for opponents to play on their home field. In four seasons Florida has compiled an overall record of 48-4 at Donald R. Dizney stadium. The Gators currently have a 25-game win streak inside Dizney Stadium, and are looking to turn that number to 26 after tonight. Coach O’Leary hopes the success will continue. You can watch or listen live on gatorvision.tv starting at 6:30pm.